Fall 2017 and Spring 2018 data are now available from the Atmospheric Carbon and Transport - America (ACT-America) project. 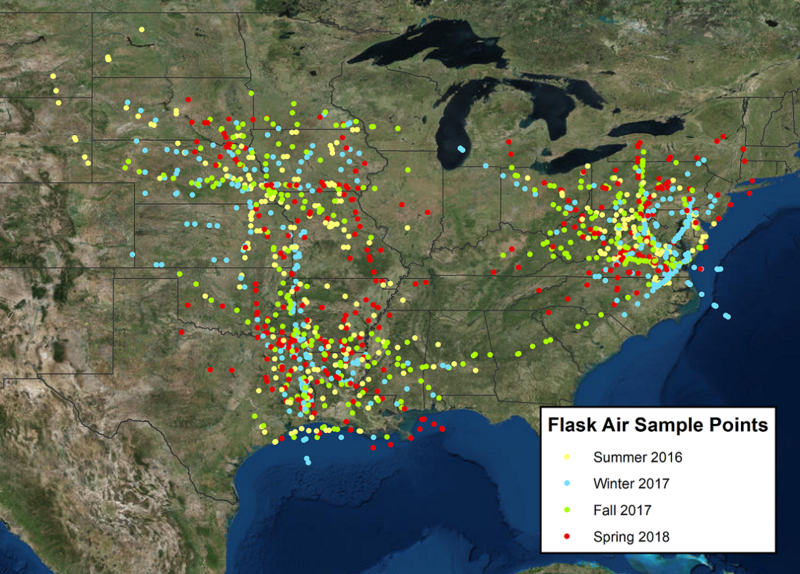 During airborne campaigns over North America, Programmable Flask Packages (PFP) collected whole air samples of atmospheric carbon dioxide (CO2), methane (CH4), carbon monoxide (CO), molecular hydrogen (H2), nitrous oxide (N2O), sulfur hexafluoride (SF6), and other trace gas mole fractions (i.e. "concentrations"). Data are available in both NetCDF and ICARTT file formats. The ACT-America, or Atmospheric Carbon and Transport - America, project is a NASA Earth Venture Suborbital-2 mission to study the transport and fluxes of atmospheric carbon dioxide and methane across three regions in the eastern United States. At times they flew directly under Orbiting Carbon Observatory-2 (OCO-2) overpasses to evaluate the ability of OCO-2 to observe high-resolution atmospheric CO2 variations. See all data from the ACT-America project.